1. Make sure Dynamic DNS is enabled for your domain. 2. 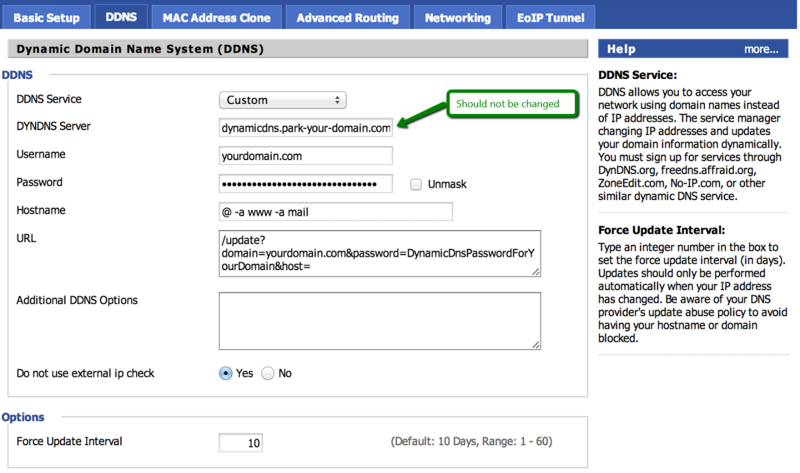 Create an A+Dynamic DNS record with any IP address for the host name you would like to be updated. Because the IP address will be automatically updated by your router, it does not matter what IP address you specify when creating the record. 3. Set up DDNS on the router. Please don't forget that the "Username" field should be filled in with your actual domain name, "Password" - your Dynamic DNS password; "URL" - "yourdomain.com" should be replaced with the domain, "DynamicDNSPassword" - with your Dynamic DNS password. To finish the setup, please click "Save" and then "Apply Settings".